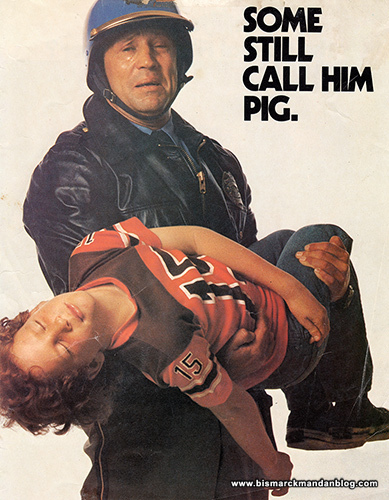 This poster hung on my dad’s garage wall for years. It later hung on mine. I haven’t decorated the garage at my new house yet, or even finished painting the drywall, but I may make a copy and hang it there, too. I believe, while everybody’s human and there are a few exceptions, that law enforcement personnel are heroes. Period. The terrorism that overtook our state over the past year wasn’t a pipeline issue for me; it was a law enforcement issue, plain and simple. The pipeline will be great for North Dakota, but that was none of my concern. What I had a problem with was my friends having to change their online presence due to doxing and threats, their families being threatened, and residents of Morton County fearing for their safety while law enforcement tried to keep up with the influx of thousands of lawbreakers. When protesters stood on Main Street in Mandan with a pig’s head on a stake, you bet that made my blood boil. When they accuse my friends of atrocious crimes, yeah I take it personally. That’s why it’s so cool to see our communities rally around our law enforcement officers. Billboards, decals, rallies…we make it clear that we support and appreciate those who are sworn to protect and serve. I hope we never have to endure another such event, but no matter what happens I think it’s pretty obvious that the residents of Bismarck-Mandan BACK THE BLUE. This entry was posted in Expository by Clint. Bookmark the permalink.